I feel like I'll be doing catch up around these parts over the next couple of weeks. I've had so many great things to share, but I've been too worn out to do much posting. So bear with me! After I pretty much freaked out in jealousy about this Krista's paperpieced pouch, Suzanne contacted me about doing a private swap. I'm back to swearing off large group swaps, but the idea of a private swap with her was totally exciting. 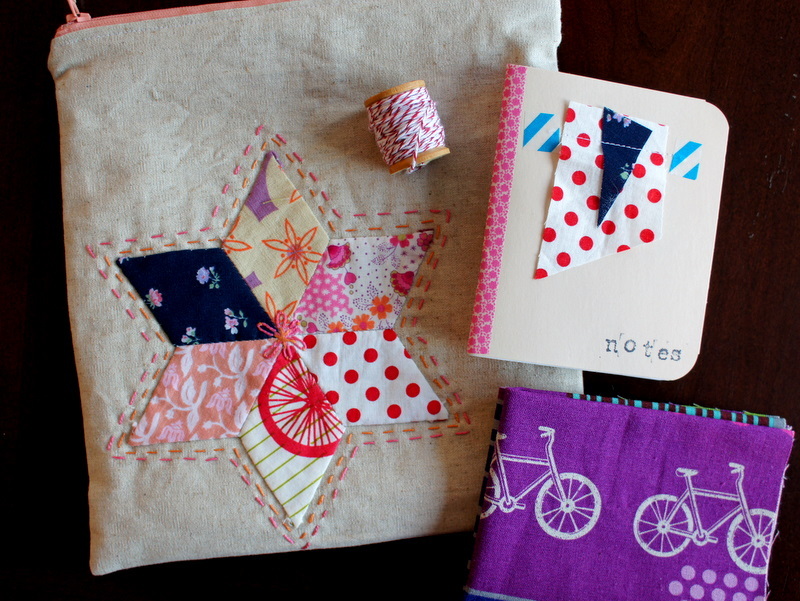 Suzanne does beautiful work, and in return she wanted a version of Cooper's mini bike quilt (something I really enjoyed making). Since I'm someone who pretty much stinks at embroidery, to get a peice of personalized loveliness like this is a dream come true. It so happens that this pouch is made to hold an embroidery hoop too. I can look at this for inspiration as I try to get better with my own projects. In return, I sent her this little quilt for her bedroom. This design never gets old for me. Suzanne and I are now both in the Pastiche Bee together, and I can't wait to get to know her better over the next year of making blocks. This experience is yet another testament to how great it is getting to know other crafters through flickr and blogging. ok those are awesome. as a newbie, can you tell me how you learn of bees to join? i'd love to join one in the new year, but always see them after they're full. both of these projects are great! very nice items to swap! Totally agree about meeting new people! Love both projects - yours AND Suzanne's! I am a lucky owner of a Suzanne creation and I love love it. Very fun!! Love your little quilt. Private swaps are so much fun. It's neat to get to know more about someone in that way. 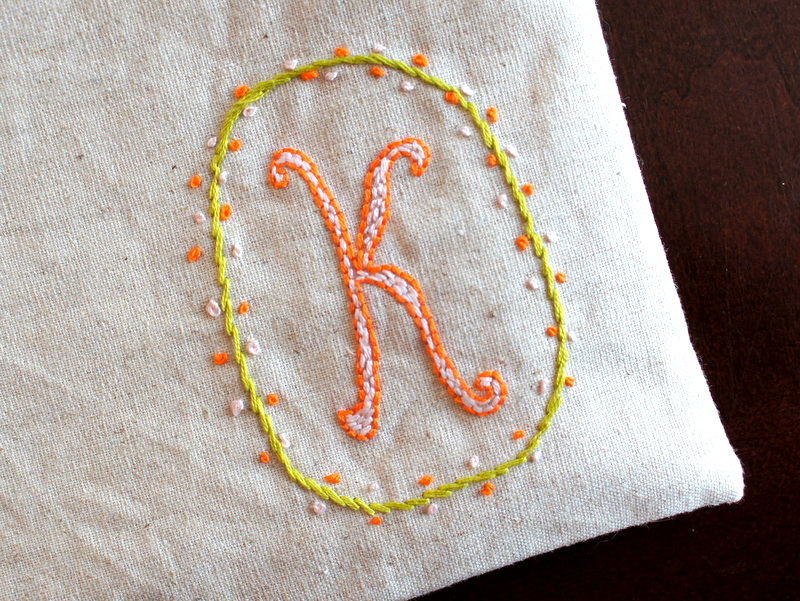 I love the pouch, and especially the embroidered K! LOvely!! I had a great swap with Suzanne as well. Now we have matching hoop project pouches! Have you entered my giveaway for the embroidery guide book? It's a great reference. Looking forward to seeing what else you've got going on, but get some rest so you're not all worn out for the holidays! The swap items are lovely! I hope you have been taking Krista's advice and are getting some rest. I just wanted to wish you a Merry Christmas and a wonderful 2012. Blessings to you and your family! 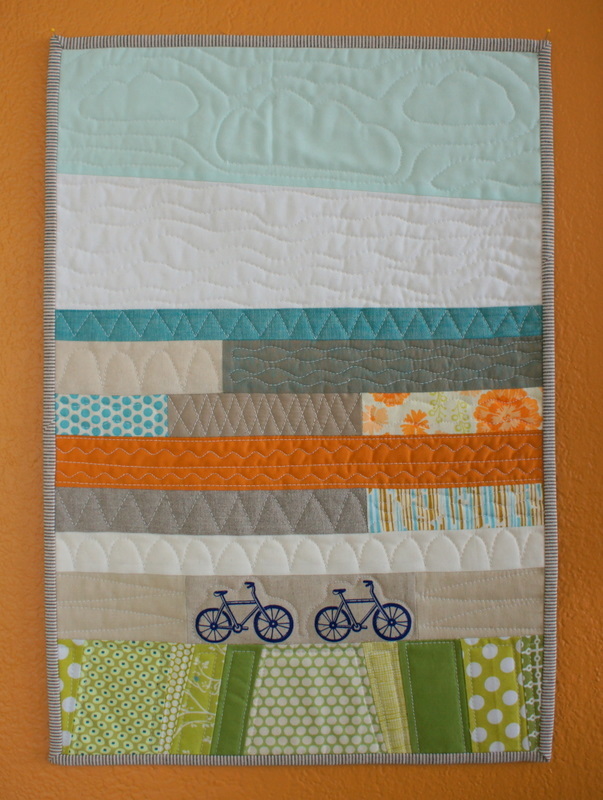 I am in LOVE with this bike quilt! Do you have a pattern by chance?